At Got Nailed? Beauty Bar & Supply we know that every one of our customers is different. This sense of individuality and uniqueness is what defines them and is often displayed most visibly with their nail designs. That is why we were one of the first salons to offer a customer-centered nail art service that creates tailor-made designs. 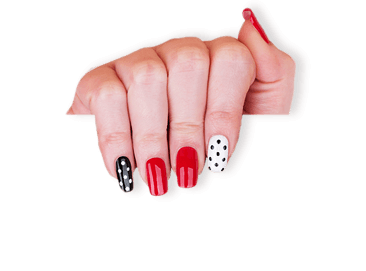 So, whether you are looking to get you nails stamped with a personal design or if you prefer some crazy geometric patterns for a night on the town, you need to contact Got Nailed? Beauty Bar & Supply today. Our skilled nail technicians possess the artistic flair and precision to make your wildest dreams a reality. Nail art is all about the individual, but knowing how to complement your nail design with your outfit is crucial. Another key part of choosing the correct nail design is picking a theme that goes with the season. For instance, if you are looking for inspiration for a nail art design in the summer time then flowers, watermelons and rainbows could be for you. While during the winter months you may prefer a festive themed creation or a snowflake design. Whatever you decide on, Got Nailed? Beauty Bar & Supply can guarantee that we possess the skill and knowhow to make it a reality. 3D nail art is one of our most popular manicure requests and it is easy to see why. The extra dimensions that are available from a 3D design increase the creative possibilities. At Got Nailed? Beauty Bar & Supply we know that listening is a very important trait. That is why when you visit us for a nail appointment, you can rest assured knowing that we will take into account all your requests. Our nail technicians have decades of combined experience in creating the most unique and impressive 3D nail designs and know exactly what it takes to achieve customer satisfaction. For many years, a perception existed that nail art and design was simply for women with long nails. This is no longer the case. As more and more women juggle the responsibilities of working and being a parent, it is understandable that the amount of women with long extravagant nails has decreased. However, having short nails does not mean that they cannot be artistic expressions of beauty. In fact, the opposite is the case. Given the correct design and precise nail techniques there is no reason why short nails can’t have the same impact as longer nails. If you are looking for inspiration for creative nail art design for short nails then feel free to call our office for a free and non-committal chat and to have a look at our in-house design book.If you are looking for inspiration for creative nail art design for short nails then feel free to call our office for a free and non-committal chat and to have a look at our in-house design book.